KOKOMO, Ind. – After two seasons leading the Indiana University Kokomo women's volleyball team, Kristen Snoddy has announced her resignation as the first head coach of the Cougars. Coach Snoddy talks with players between volleyball sets. 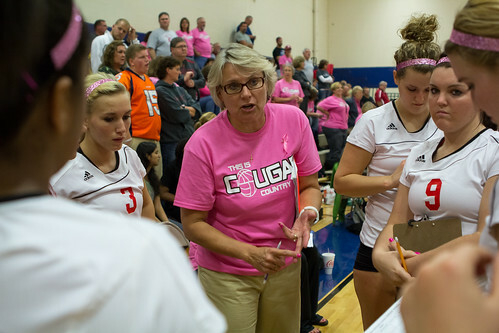 "I feel very honored to have been a part of the initial phase of the Cougar athletic program. What has been particularly special for me is that I was able to combine two of my passions – athletics and the IU Kokomo campus," Snoddy said. "Even though I have stepped down as a head coach, I will continue to follow this new aspect of student life with pride as it matures." Snoddy guided the Cougars to a 9-25 record in her second season, including a historic first NAIA win – a tough four-set match – against Purdue University Calumet at the Illinois Institute of Technology Kickoff Tournament in August. "Coach Snoddy was this program's foundation, and without her we wouldn't be where we are today as a team and program," said veteran player Emily West, a sophomore. "She means the world to me, specifically by being there to talk to and get advice." The Cougars finished the 2012-2013 inaugural NAIA season with a hard-fought, five-set win over Aurora University. They recorded a total of nine wins, eight of which were on the road, as well as a home victory against IU Northwest in a three-set sweep at the end of September. "Coach Snoddy genuinely cares for our team and wants us to succeed in the classroom and on the court," said sophomore libero Lael Burrus. "She helped establish something that is going to continue at IUK for years to come. I have a great amount of respect for her." Off the court, Snoddy, a senior lecturer in English, played an important role in helping her team stay focused on academics. She encouraged and mentored the student athletes to concentrate on succeeding in the classroom. In addition, the team devoted time to community service projects, such as spending time with senior citizens during the Senior Olympics at the Kokomo Senior Center. "We are very appreciative to Kristen Snoddy for launching our women's volleyball program. Having a faculty member as a coach emphasized the campus commitment to an athletic program with a foundation of academic excellence," said Interim Chancellor Susan Sciame-Giesecke. "Kristen is an outstanding instructor who created a quality volleyball program with solid student athletes. Her efforts provide a great vehicle for future successes."